You are looking for a caterer with focus on fresh and healthy food? Congratulation - you found it! Our core catering products are premium salads and bowls, delicious soups, tasty different sorts of bread, creative fingerfood and little snacks in preserving jars. In addition we also deliver vitamin-packed juices and fresh smoothies filled in To Go bottles or glass bottles. 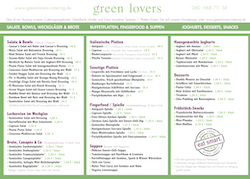 The concept of green lovers is the perfect spot for modern, healthy food interested people who are looking for high individuality and diversification. Often time is missing for eating healthy food on a day-to-day basis – green lovers catering is the answer for solving this problem! We deliver healthy and high-quality food to your office or company. Since our foundation in 2011 our catering service delivers multiple well-known companies in the city centre of Hamburg and Hafencity. We offer our catering service for different events, such as healthy breakfast, team lunch, business catering, conference catering, seminar & workshop catering, lunchbag catering for company outings or individual catering for your special health day of your company. Usually the ocassion for catering demand is clear. But often there are many questions to be answered: How should the catering to be realized in detail? Which kind of food and drinks do fit to this event? How should the setup of catering look like (e.g. buffet catering or flying buffet)? Do we need service staff or only napkins in combination with fingerfood? We consult you to find the right solution for your event and recommend the adequate catering package. Together we will evaluate advantages and disadvantages of different catering types. For example: buffet catering could be the best choice for team lunch, whereas flying buffet catering is more appropriate for PR events. Fingerfood is the perfect match for events where space for dishes is very limited and food should be bite-sized. We listen to your special desires and ideas for your catering event in order to develop the right solution. Furthermore green lovers also offers vegan and vegetarian catering options for your guests. Salad / Bowl catering can be delivered in various types: different salad / bowl combinations on plates or single packed salad / bowl boxes which can be easily picked up by your employees. If you are looking for a reliable caterer for business catering or private catering in Hamburg, do not hesitate to contact us. We would love to advise your catering request and to send you an individual offer. Format: PDF, Filesize approx. 57 Kb.